As mentioned, the Phizzog Phestival was set up by Carrie & Billie Hoyle to replace the much-loved, internationally attended Welsh Face & Body Festival, and also the UK Body Festival, both of which were cancelled this year. 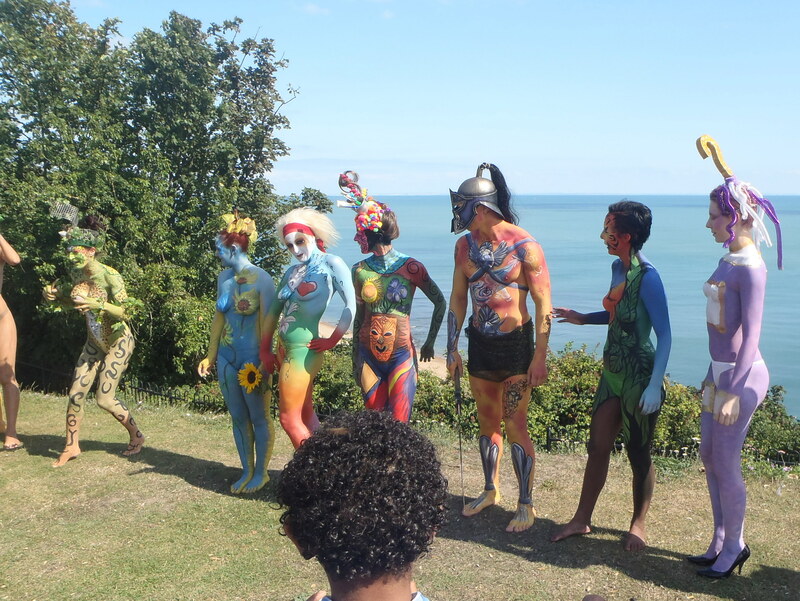 It was to be hosted in Folkestone along with the world famous Folkestone Art Triennial, over 2 days. I arrived LATE Friday night, held up by road works on the M25 and a terrible accident on the motorway just outside Folkestone, which doubled my journey time and closed that route for most of the weekend. After a strange ‘welcome’ by hotel staff who were shutting up, I eventually managed to track down Paul of Facade Glitters with Carrie and the rest of some familiar painters, outside a pub in Folkestone Harbour. It was fab to catch up – even though we are mainly so knackered after painting that we hardly manage to wash ourselves and our kit before starting the next competitive paint the next day, a lot of this crew are like extended family and really lovely! We didn’t stay up ‘too late’ – I had meant to be cutting stencils for the vague design I had in mind, but ended up on a hunt (via most of Folkestone and a seagull) for a 24 hour supermarket with Paul so we could feed all the people at his hotel apartment where I was staying that weekend. Zoe and I stupidly stayed up even later talking through our vague ideas in our bedroom! Saturday was scorching already by 9am, as I hauled my kit up all the stairs at the front of the Grand Hotel, and into their conservatory where we were painting that day. The Lovely Laurence Caird (aka LL as discussed before:)) had kindly offered to be my model for the day, and we shared a table with Zoe who was painting Jade. The theme for the 1st days painting was “Where Art Thou’. My only vague idea was based on my hubby Peter’s favourite film, ‘O Brother Where Art Thou’, which it turns out was a modern take on Homer’s Iliad, aka the Odyssey. I thought it would suit LL’s figure too, he’s got such a lovely macho gladiator shape! 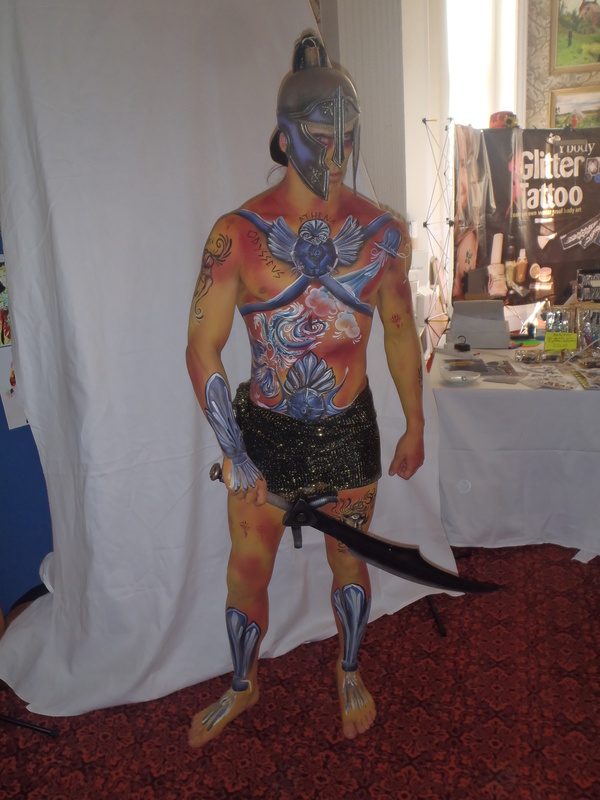 Simon Smith, an airbrush bodypainter who was originally a photographer but was seduced by the painty side, had leant me a helmet and sword he’d made for a bodypaint last year on Stacey. Simon makes the most STUNNING props out of household materials (cardboard, pipe lagging, car filler) that look even better than the film replicas but are a fraction of the cost as well as way more durable. As soon as I saw the purple-tinted armour, I decided we would do a contrasting skin colour (that warm golden-yellow DFX and Grimas red again) as there’s no point in spending hours painting skin skin colour. 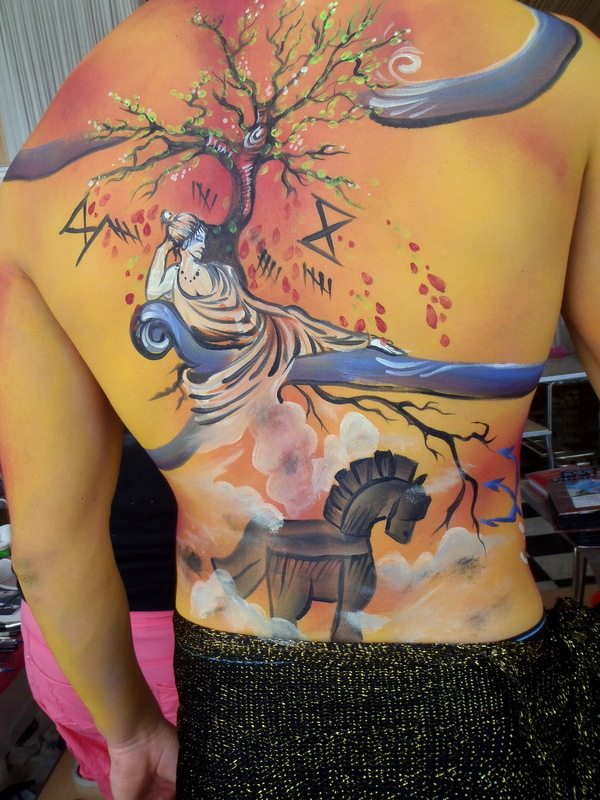 And as it was a competition I wanted as much colour as possible and as little bare skin as poss. 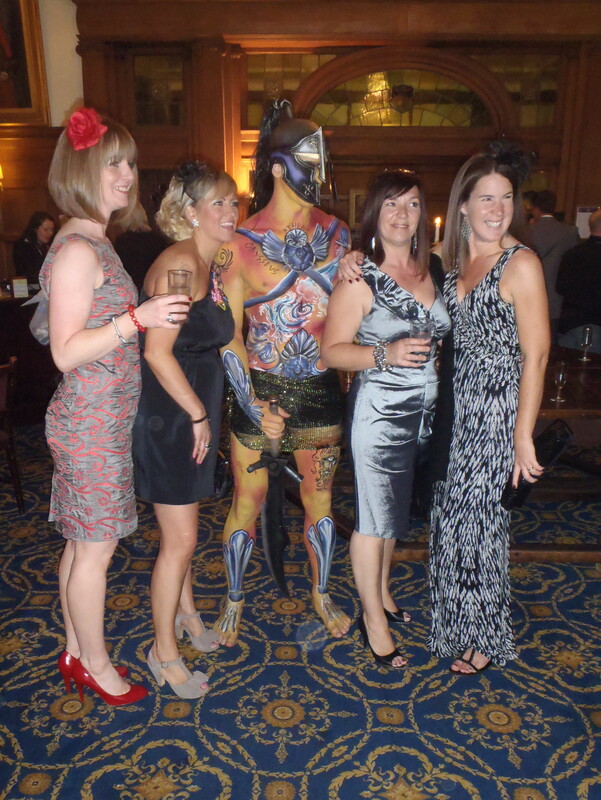 And anyway the Romans etc used to paint their statues garishly, I hear! ooooooo, LL became a bright yellow/red warrior with purplish ‘armour’. Odysseus’protectoress was Athena so her owl symbol was on his chest, augmented with some BodyFX NZ breast covers redeployed as belt buckles/ owl body. I then attempted to portray as much of the 20 years Odyssey as I could. On LLs back was Penelope, the wife left behind with his newborn son, whilst Odysseus spent 10 years fighting in Troy, where he had a lot to do with the Trojan Horse. She is sat under a tree as when he finally returned 20 years later she didn’t recognise him and he had to tell her about their marriage bed being made from a living olive tree before she believed him. The dropping leaves were turning into blood for all his battles but green near her for remembrance. 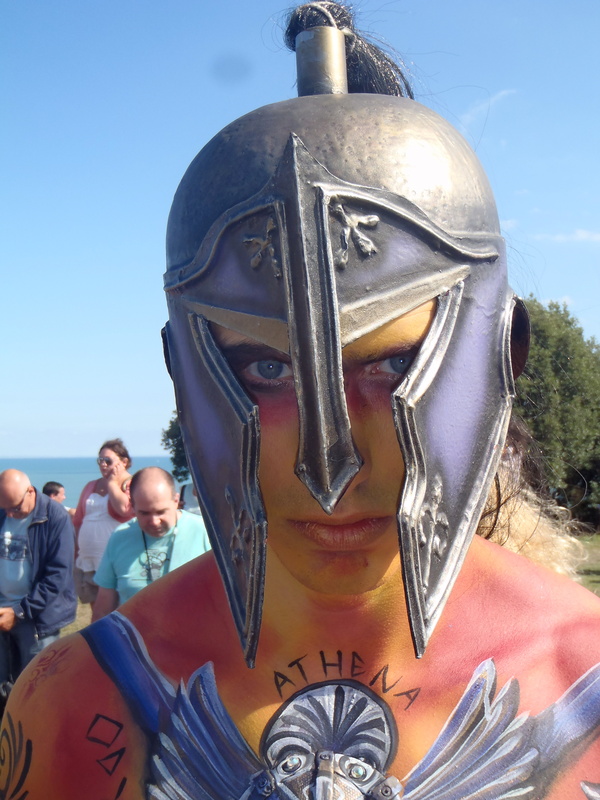 After Troy fell, Odysseus & his men left for home in their ships but mainly due to his men being idiots on several islands, were cursed by Poseidon (they blinded the cyclops who was his son – I drew a face for him) to wander for 10 years more. Aeolus the wind god kindly gave Odysseus a bag of winds to blow them home but again his men foolishly opened it whilst Ody. was asleep which caused a huge storm and meant they lost the good winds home. They ended up on the sea witch Circe’s island and to free his men/ get them turned back to humans (she made them pigs) ody. had to stay with her for 1 year. Later, heading home again, his men killed Helios’s sacred cattle and were eventually all killed in return, but Ody washed up on Calypso’s island. He spurned her love and she held him captive for 7 years until Athena persuaded Zeus to send Ody’s grandfather, Hermes, to help free Ody. Which is why I did winged heels. I wasn’t really happy with the overall design and specifically hated the owl but I just ran out of time/ ideas. Luckily LL is SO lovely people seemed to respond to him rather than the paint:) I didn’t do anything except slightly spike his hair with some L’oreal, as he mainly wore Simon’s amazing helmet. There was a delay in judging as the hotel had wedding guests drinking at the hall bar and wanted them all out of sight before our models emerged. After a LONG time they still hadn’t shifted so we escorted all the models out anyway, they were sweating waiting in the heat and we had a series of workshops etc to fit in which were already well behind schedule. The guests were not upset, as the hotel had worried; I turned round at one point and found half of them had followed us out, including bridesmaids! So, we had moved judging out to the public park. We immediately drew a very interested crowd, and just as has happened with people walking past the hotel all day, the public stopped and came over to talk to us and ask questions and try to get photos with the models. 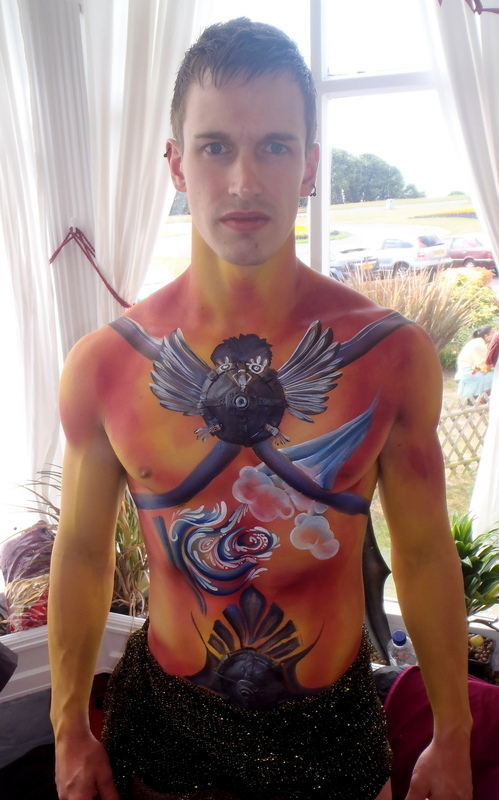 As I mentioned we didn’t paint nudes or even bare breasts and most of the females were so well disguised by paint & props that you ‘saw’ less flesh than you would on a beach; everyone was admiring the art and the patience of the models to have stood for so long being decorated. After numerous official (and un-) photos we all began returning to the hotel, so that we could tidy up, start workshops, and the models could wash off. LL headed off to take his mum around London (he’s such a lovely lad:) and I went on a trek to find food. 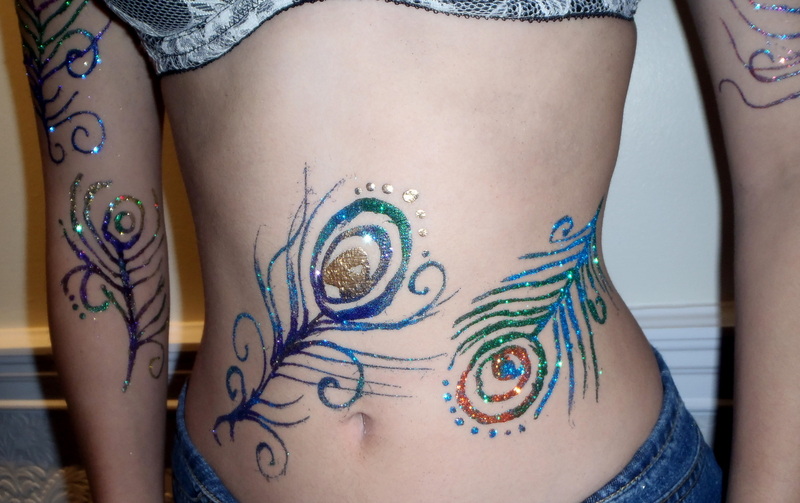 And then ran my own freehand glitter tattoo workshop (fantastic ladies, lovely to meet those I knew and make more friends too) and went on to attend Simon’s excellent prop-making demo too. Another late night!